Lavatories have the unfortunate combination of the worst of a public washroom in a space seemingly less than half the size of a typical private bathroom in your home. When nature calls, dozens of people have no choice but to answer — and answer they do, in ways where you know they were there with evidence that can be overwhelming when it is your turn to use the lavatory. When such tight quarters are used for so many people, cleanliness and respect for others can take a back seat — or a toilet seat, to be more apropos — to carelessness and apathy, which can become more and more contagious as the lavatory degenerates into little more than the toxic dump of the airplane. One postulate which is almost a given is that the longer the flight, the worse is the condition of the lavatory — and on a long-haul international flight, the lavatory can get so unbearable that you might try to hold off until you are in the airport after the flight has concluded and the airplane is at the gate to use a legitimate washroom. Here are 16 tips for helping to mitigate the unpleasantness of a lavatory after using it; or — in other words — how to use and leave a lavatory aboard an airplane, based on my experience as a frequent traveler for years. Regardless of whether you are male or female, be careful how you expel liquid or solid waste from your body. I know I do not leave a mess around the toilet in my bathroom at home; and I similarly take care when using a lavatory aboard an airplane. Remember — if you sprinkle while you tinkle, please be sweet and wipe the seat. The members of the flight crew are not janitors and will not constantly clean the lavatory — especially while they are serving your food or are on their rest breaks. …there are passengers who do not give a second thought about using a lavatory while wearing only socks on their feet — or worse, wearing nothing on their bare feet at all. Chances are that these are the same people who place their feet on armrests, the monitors of in-flight entertainment systems, the backs of the seats in front of them, the bulkhead wall — or even that magazine in which you are about to read. When I really need to use the lavatory, I always ensure that my shoes or sneakers are on my feet first before leaving my seat. I really do not want to stare at urine left behind by someone else — nor to I want to smell the remains of feces and see the shades of sepia and burnt sienna used in that abstract artwork on the canvas known as used toilet paper. Worse is when several people consecutively do not flush that toilet before you use it. Not only can the fumes be overwhelming; but they just might kill or seriously impair those poor people who are assigned to seats within close proximity of the lavatory. Please flush that toilet after you use it; and do not worry about wasting that bright blue liquid. That is the sole reason why it is there. Also, consider lowering the lid for fellow passengers before leaving the lavatory, as demonstrated by the photograph on the right. …it is bad enough to see toilet paper left over in the toilet after the last person uses the lavatory; but to see used toilet paper on the floor is simply downright disgusting and unsanitary. Dispose of toilet paper in the toilet. After all, there is a reason why the word toilet is part of the name toilet paper. I thought I would throw this one up: if you are in the lavatory and know you are going to vomit, please use the toilet and not that minuscule sink wannabe which can barely drain plain water. The toilet is much more capable and effective at removing evidence of your digested beef or chicken dinner. Unless the source of the water used for hot drinks is either bottled or not from airplane itself — or, at least, is hot enough to have been boiled — it may not be completely safe to drink. Zach Bjornson-Hooper — also known as FlyerTalk member T-wiz and the son of FlyerTalk member l’etoile — took samples of water from different commercial aircraft on a trip back in 2002 and used them as part of a science project at the age of 13 years old. His persistence and innovative results found — among other things — insect eggs that days later in the lab hatched into maggots; and The Wall Street Journal published his experiments and findings. I briefly revisited the potability of water aboard commercial aircraft in this short article posted on Friday, June 25, 2010 here at The Gate. After using the sink to wash my hands thoroughly, I dry my hands with paper towels, which I then use to wipe the basin of the sink and surrounding areas dry. It only takes a few seconds or so; and the lavatory is significantly more presentable when it looks neat and clean. Even better is if you can leave the lavatory in a better condition than in which you found it in the first place. I have done that in the past. …paper towels do not belong all over the sink area — or sopping wet in the basin of the sink — after they are used. Paper towels left in the basin in the sink typically block the drain and cause water to remain stagnant in the basin — rendering the sink basically unusable until those paper towels are removed and disposed properly. Worse, I never throw used paper towels into the toilet — especially on a smaller aircraft such as a regional jet airplane. That can actually clog the toilet and render the entire lavatory unusable — and on a regional jet airplane which typically only has one lavatory, that can cause discomfort an inconvenience during a flight; and can even cause a flight to be delayed. I always dispose of paper towels in the trash receptacle, which is usually built into the lavatory near the sink. There is little that is more frustrating than using a lavatory — only to find that there are no paper towels; no toilet paper; or no soap with which to wash hands. If I notice any essential supplies for the lavatory to be either low or depleted, I report it to a member of the flight crew as soon as possible so that they may be restocked. Passengers cannot visit the lavatory during take-off and landing of the aircraft — nor during turbulence — so use the facilities at the airport prior to and after your flight, if it is at all possible. 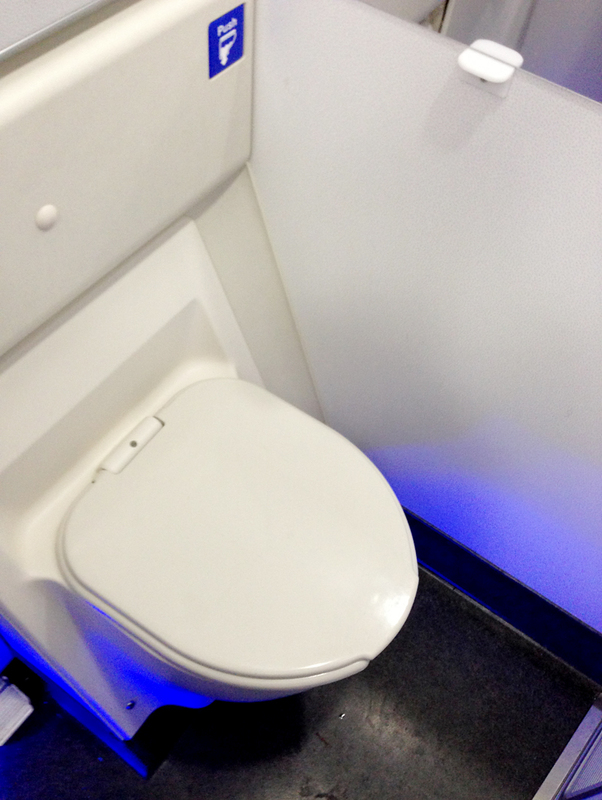 An occupied lavatory can potentially delay the operations of a flight. If you do need to use the lavatory aboard the aircraft during a long-haul flight, the best time is when the majority of passengers are sleeping and no one is using the facilities; while the worst time is just after a meal service, when long lines form. Try not to use the lavatory during a meal or beverage service. The cart used by the flight attendant might block the aisle — and thus, your way between the lavatory and your assigned seat. Another good time to use the lavatory is when you feel that first subtle drop in altitude of the airplane prior to landing and the sign to fasten your seat belt is not yet illuminated. This typically occurs approximately 45 minutes prior to landing the airplane. Regardless, your best bet is to not attempt to use the lavatory while the sign to fasten your seat belt is illuminated, which is for your protection as well as for the protection of others. Try not to do any tasks which are not essential for using the lavatory — such as using your portable electronic device or improving your beauty. Lines to use the lavatory usually form on flights — especially after a meal service on a long-haul flight — and the need to urinate or defecate takes priority over brushing teeth or combing hair. I use a lavatory primarily for urinating and washing my hands thoroughly afterwards, which only takes a few minutes. If there is anything else I need to do, I typically wait until I get to my home or a hotel room. If I happen to be in line to use the lavatory — which is rare because I typically avoid waiting in lines of any kind if it is at all possible — I remain courteous and polite to other passengers who are also waiting. After a reasonable amount of time passes — say, seven minutes, as an example — and passengers await their use of the lavatory, a reminder knock on the door of the lavatory may be necessary. If the occupant of the lavatory does not respond or exit after ten minutes, alert a member of the flight crew to the situation, as the passenger could either be experiencing a medical issue which may require attention and assistance — or could possibly be engaging in illegal activities. …and again — rare as it may be — I have accidentally opened the door of an occupied lavatory thinking that it was unoccupied because it was not locked. Always ensure that the door of the lavatory is closed and locked while in use to prevent unwanted “surprises” from happening. …and if you are standing outside of the lavatory door, stay far enough away as to prevent yourself from potentially getting hurt, should the occupant of the lavatory throw the door open with full force and reckless abandon. If the lavatory is located near the galley of the aircraft, try not to disturb the members of the flight crew while they work, rest or eat; and if you must stand in or near the galley area, at least acknowledge the presence of the members of the flight crew and even politely ask if you are disturbing them if you stand there. I have heard countless stories of the diapers of babies being changed at the seat instead of on the changing table in the lavatory; and I have even witnessed it — with both my eyes and my nose — on several occasions. Worse is when the parent expects a member of the flight crew to take away the soiled diaper. There is a reason why a changing table exists as part of how a lavatory aboard an airplane is equipped; and there is also a proper receptacle to dispose of the diaper before leaving the lavatory. If you are traveling with a child — or a dog, for that matter — please do not leave the child alone in his or her seat and automatically assume that a fellow passenger or a member of the flight crew will babysit the child for you. Either take the child into the lavatory with you; or politely ask a member of the flight crew if he or she would be willing to watch your child for you while you use the lavatory. By the way, short-term babysitting service by a member of the flight crew is one of the ten things for which you can ask — free of charge — abroad an airplane — free of charge. …and if that happens, the lavatory can be opened from the outside if necessary. “Hey, uh… Ralph?” asks Ed Norton during this episode of The Honeymooners as he is accidentally handcuffed to Ralph Kramden in a sleeping car aboard a train. “What?” responded a tired and frustrated Ralph. …especially as lavatories are usually equipped with smoke detectors; and tampering with, disabling or destroying a smoke detector can be punishable by law — but you travel frequently enough that you have heard that countless times during the safety announcement and probably can recite it backwards by now. I did not include in this article the controversy of whether or not passengers seated in the economy class cabin should be allowed to use lavatories located in the premium class cabin, as that topic has its own separate article. I have found that politeness and respect go a long way towards a better travel experience; and if everyone practiced the advice listed above — especially on long-haul international flights where the airplane is your home for at least 12 hours — the experience of using a lavatory can potentially improve significantly for all occupants aboard the airplane. Better yet, try to leave the lavatory either in the condition in which you would have preferred to have found it when you first entered it — or, at least a condition which would be an improvement over the way you found it. 21 Passengers We Hate on Flights? So sad that you need to post this but I think people need the reminder. The only thing about baby changing is many legacy aircraft don’t have changing tables. I am guilty of using the seat with a changing pad (when I purchase my infant a seat) and we have the whole row to ourselves and there isn’t a changing table (us air legacy). But I always throw the diaper away myself and wash my hands. Sometimes you have to work with what you have, EA. If there is no changing table, then what choices do you really have? The point is that at least you take care and consider fellow passengers; and you cannot be faulted for that. I, for one, appreciate that. Thank you. I like how you recommended going with your children to the airplane lavatory. My husband and I will be traveling with our six-year-old son for the first time soon. We’ll make sure and go in with him so he can reach every thing and make sure he can get himself out. There is an age when a child is too large to fit on the changing table they have in planes AND the child is also too young to use a toilet. None of my children fit on the changing table at 1 year old. My husband is Japanese and we need to fly out to see his family–his father recently had stomach cancer. More should be done to help parents have a place to change their children. I don’t suppose you have any tips? I’m dreaming someone will invent something to save us. I feel like everyone hates me on a plane no matter what I do and how much I prepare to change my child’s diaper. Everyone looks at me like I’m doing it wrong. Which, is hurtful since my daughter is a human and not an alien or a worm and we were all children once.